Note from Dave: Sean is a prolific member of the LMHR Facebook Group and I was keen to share this remarkable experiment with you all as a guest post here. Enjoy! My name is Sean Brennan and I have been on a ketogenic diet for 14 months now, beginning on Thanksgiving of 2017. It has been awesome – 35 pounds melted away in the first 6 months and I have a more stable mood, better digestion, resolved eczema, and have more control over my appetite. Unfortunately, I did not do a baseline blood test prior to the diet, however, I found a blood test from 2011, while I was eating a High Carb Low Fat/Standard American Diet. I was probably eating a vegan diet at that time: total cholesterol was at 191 mg/dL and HDL at 38 mg/dL. I had read that if you are in the middle of losing weight you could skew your blood test, so I waited until my weight stabilized to get testing done. Back when I was eating a vegan diet several years ago, I became aware that saturated fat increased my cholesterol. I had tested around 240 mg/dL (the horror!) and I promptly decreased my coconut oil (high saturated fat) intake and saw my number drop to 165 mg/dL. So, when my initial test came back after a keto way of eating with a total cholesterol of 313 mg/dL, I was not surprised. However, I was very surprised at my triglyceride reading of 131 mg/dL. Typically, on a ketogenic diet it is expected that triglycerides drop like a stone due to the limited carbohydrate intake. In fact, many people will have a triglyceride to HDL ratio approaching 1:1. So, I was a little concerned that my ratio was 131:47 or 2.79:1. Thankfully, I was aware of cholesterolcode.com and Dave and Siobhan’s work. I promptly became a member of their Facebook group for Lean Mass Hyper-responders, and asked for advice regarding my numbers. Siobhan directed me to a blog post for people who likewise had high triglycerides while on a Low Carb High Fat diet. Of the suggestions listed, the only one that stood out to me as a possibility was a coffee sensitivity. 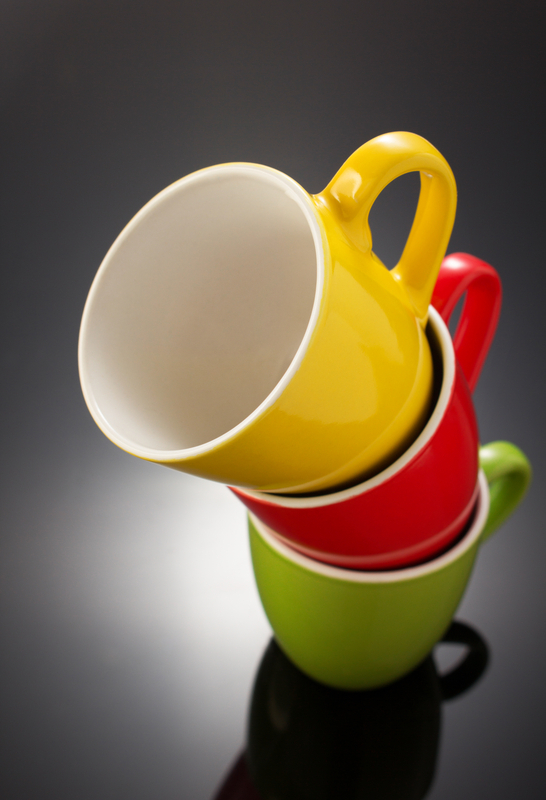 Prior to test #3, I had 1-3 cups of coffee per day for several months. So, I decided to cut it out and retest. Somewhat painfully, I was able to cut out coffee for four days prior to test #3. My triglyceride test result was 76 mg/dL, a dramatic decline from 131 mg/dL! Better yet, my trig:HDL ratio was 76:51 or 1.49:1. I was a happy camper! I maintained my coffee abstinence and achieved similar, if not slightly improving triglyceride results, for test #4 & #5 of 71 & 70, respectively. 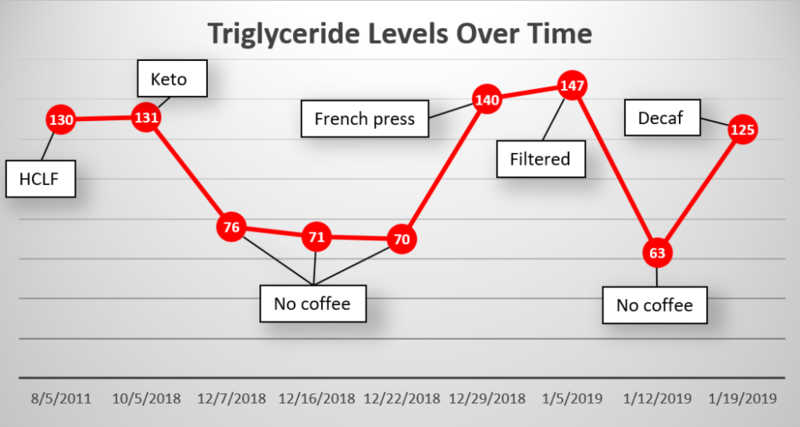 To confirm the effect of coffee on my triglycerides, I drank a cup of black, French press prepared coffee on two consecutive days and re-tested. My trigs effectively doubled back up to 140 mg/dL! For test #7, I drank filtered coffee for a week and saw similar results of 147 mg/dL. I abstained for another week and predictably my triglycerides fell back to 63 mg/dL. For one final test, I drank decaf for a week and interestingly saw my triglycerides climb back up to 125 mg/dL. So, it is clear to me that unfiltered, filtered, and decaf coffee dramatically raise my triglycerides by a factor of 2. This is quite the effect, although I really am not sure why this happens or if it is harmful (though it definitely makes me uncomfortable). Summary of the changes Sean saw. Dave suggested that there is some evidence to support the hypothesis that coffee increases lipolysis, that is, it possibly super charges fat trafficking. Another interesting tidbit of information is that I have a gene (CYP1A2 – rs762551(A;C)) that indicates slow caffeine metabolism – although this may or may not be related. What do I plan to do with this information? Well, it has been theorized that while eating a low carbohydrate diet, high total and LDL cholesterol may not be harmful especially if one’s trig to HDL ratio is low. 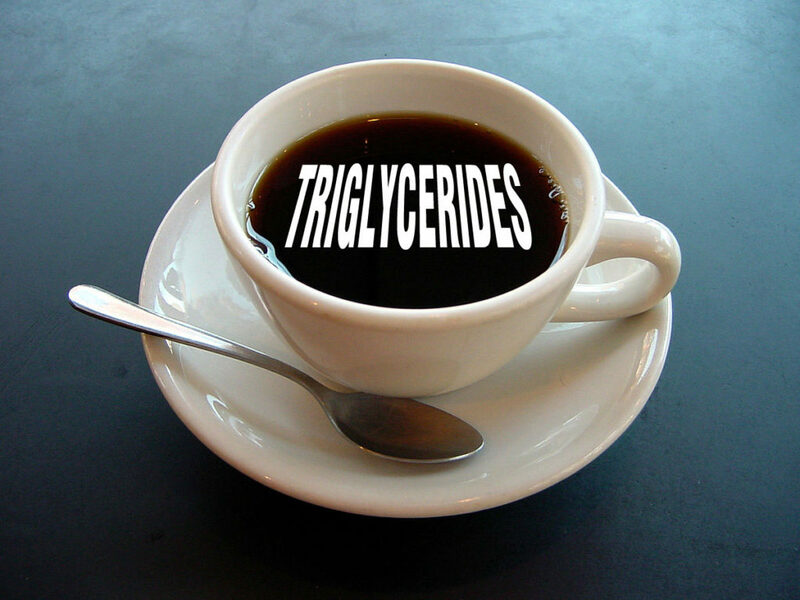 I am comfortable living by this theory, and therefore, I think it is in my best interest to keep triglycerides low by greatly reducing coffee intake (and maintaining my low carb lifestyle). I don’t think there will be a net loss to my well-being, since coffee tends to lower my energy after the initial bump, boost my stress hormones, negatively affect my digestion, and sometimes interferes with my sleep quality. So, as the reasons stack up against coffee for me, I plan to only have it as an occasional treat or productivity boost. Very interesting thank you! Do you think the mechanism is related to caffeine directly, or perhaps some other compound found in coffee? I am a heavy tea drinker with low trig, but I can’t stand the taste/smell of coffee otherwise I would experiment myself. Also I believe tea typically has much less caffeine than coffee does. Well, he did do a bout of decaf coffee, which ended up with him raising his triglycerides again. But, in all fairness, decaf coffee still has some caffeine. So it’s a bit of an unknown… but if it were caffeine I’d at least expect *less* of an effect from a lower dose (e.g. decaf) which isn’t what happened. It’s quite curious. I am a coffee lover and usually drank about 6 espressos a day. It did worry me enough when my cholesterol suddenly became high to start reading and I found an article saying it is not the caffeine but caffistol that raises cholesterol. If you stop coffee your cholesterol will be down in 2 weeks. I did and 2 weeks later my cholesterol was low again. Interestingly also was the fact that espresso or the plunger method is worse because a paper filter removes most of the caffistol whereas the metal filter does not remove it. Yes we drink tea and coffee. Tea also contains caffeine. Any volunteers with home monitor for conducting a trigs test for tea? Just as important as coffee! I’m CC, and find a difference in pulse (-4-5bpm) and BP (-10-12 points, diastolic and systolic) when I eschew coffee. It may increase my TG some, but I find my level of exercise a bigger factor. I also have (CYP1A2 – rs762551(A;C)), but my last TG in Dec was 74. 2-3 cups of coffee a day. So, that may not have anything to do with it. On Keto for 9 months with stable weight in Dec. TC 242, TG 74, HDL 66, LDL 161. I am not sure if I am “lean”, but the meter at the gym says my BF % is 16. Check your Lp(a).. you may have it. Would love to see people do similar tests using a third group: decaf coffee. Is it the coffee bean, or caffeine? But, with that said, I believe decaf does have a tiny bit of a caffeine left in it. EDIT: I confirmed with Sean that this was correct, and have since edited it. Thanks so much for pointing out the error! My trigs went from 2.28mmol/L to 1.29mmol/L when I quit coffee. I also have (CYP1A2 – rs762551(A;C). I haven’t had a drop since and my last Trigs were 0.76mmol/L. Maybe you meant Thanksgiving 2017? Thank you and very interesting! As a coffee drinker with high HDL and very Low Trigs, I shall follow suit by cutting down. I am also LMHR, I would love to do that experiment on myself but the needles YIKES! If not a LMHR but Keto is the effect the same? I think there is wide individual variation… some people seem to not be affected the same way. I believe it has something to do with the coffee oil. Is cafestol the issue? Any chance Sean would test this hypothesis by repeating trial using paper filters? PLEASE? Hi I see filter in the graph but the commentary describes day 6 and 7 as drinking French press. Could you clarify with Sean which it was? If never refers to filter in the written text? Sorry if I am pedantic or missing something. Test 7 was using a filter – although I’m not sure if it was a paper filter. I find this interesting. I use a screened filter, not paper with a Keurig adding my own coffee not a pod. I drink almost all decaf, about 80% and add a bit of caffeinated. In my other cholesterol tests prior to LCHF, I had much lower triglycerides. My sister has a similar profile to me, but her triglycerides are lower. She drinks completely caffeinated coffee and multiple cups per day. Is is possible that the coffee causes some sort of vitamin deficiency? Any alcohol consumption during this period? Perhaps compare with a caffeine pill? As a counterpoint, I drink 20 oz of very strong dark roast coffee and another 20 oz of very strong decaf dark roast coffee every morning. My fasting triglycerides are under 40, sometimes as low as 20. For me, low carb + daily intermittent fasting + high intensity strength training are likely other relevant factors. Also…I haven’t done the genetic test, but based on the all-day caffeine boost I get from early AM consumption I’m pretty sure I’m a slow metabolizer. Even at lunch caffeine can keep me up at night. Me too. I can only drink it in the morning. This is the case with dark chocolate too. Yeah – it seems not everyone sees this effect (myself included). We’re not quite sure where the difference lies at this point though. Another fascinating observation. Yes I drink masses of coffee but it doesn’t seem to relate to my trigs either. Looks like some people are hyperresponders and some aren’t. Mine are directly related to carb intake and indirectly related to something else, I know not what but it isn’t coffee. Did he control for diet, exercise, length of fasting, and other factors that affect trigs? I drink the same amount of coffee/green tea every day, and my trigs have varied from very low to high, and the main factor I can discern was the amount of fasting I did in the days/weeks prior to the test. I’d prefer to see that he (1) at exactly the same things (2) at the same times and (3) had the exact same amount and type of exercise and at the same time, while having or not having coffee. Otherwise, as Dave’s own data shows, these numbers are so highly variable, that coffee may or may not be the cause. Typically multi-day fasting before a blood draw results in higher total cholesterol, and LDL, lower HDL, and trigs higher earlier on and then this seems to normalize the further in you go. I did a 7 day fast and posted my results here. Siobhan Huggins . 2 weeks steak/water, 2 weeks steak/coffee, 2 weeks steak/decaf. 6 consecutive weeks, full panels before, after, inbetween. In 2017, whilst I participated in a 30 day steak challenge with my friend Donna Lordi, Dave and I observed an alarming jump in my triglycerides from 90 to 560. We discuss it in a 2KetoDudes podcast. We are replicating my conditions now. So steak-only again this time. I wonder if he ever tested his insulin levels. Coffee is very high in salicylates, and those sensitive to salicylates can produce excessive insulin (and excessive insulin can impact triglycerides). My husband, who was mostly carnivore, removed coffee, tea, and no longer has the occasional berries and avocados, and now has now broke through his weight loss plateau. Other symptoms have improved as well (though there was a bad withdrawal period similar to SSRI withdrawal). So I’d be curious as to any other tests done as well, and what the author’s daily diet looked like. That is very interesting. I switched to caffeine free coffee. I was having full blown panic attacks and anxiety ! I tried to find info and all I found was it causes mild withdrawal. I was freaked out. I saw my doctor about it thinking I was going crazy. Didn’t want to “try” drugs. Is there any research out there that explains it ? You could check out the facebook groups… Dave does not comment on every post but their are a lot of smart people in there. Also, if you participate in the group for a little while you begin to see patterns and will get up to speed quickly.
. I love my cup of coffee in the morning. I never did drink coffee or tea and I historically got my caffeine from Diet Coke. I have recently cut back on the Diet Coke and now I take a caffeine pill if I need a boost. 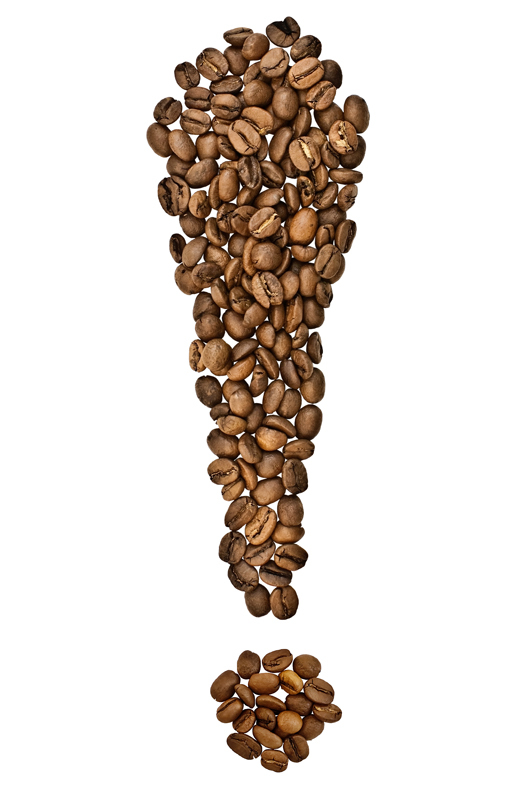 Let,s face it, the reason coffee is so popular is because of the caffeine boost it gives. I have not done caffeine and trig testing. However, it is very likely that I did each of my blood tests food fasted for at least 14 hours and I would have had about 1 liter of Diet Coke each day before the blood draw in the afternoon and my trigs have always been under 50 mg/dL. I make this comment just to add support to the theory that it is not the caffeine that is raising you trigs. Great info will try the no caffine days before my next bloodwork and see what happens to my Trigs. It is really great to do some experiments on our self rather than just relying to established medical information. Well, there is not sense to reinvent the well but when in it comes to health, I guess it still is best that we really know our own health factors. I have a bulks and bulks of puer cakes tea both green and black. When i finish it or rather give it away in the proper hands – i have no further intention to by new cakes coz i dunno how it affect my metabolism regardless even considering the fact chinese tea was a great deal and passion and big chunk of my culture for me for years, i even study chinese because of this. But i have even greater passion for my health. So no more tea, alas. Alas, we didnt realy know if it something to do with caffeine itself or some solids in coffe-bean and random components of final product as well. So we need to know what happened if you drink just plain tablet caffeine to the purity of the expirement – too pity author didnt include this in his study. But, it’s worth noting that not everyone seems to see the effect from coffee in the first place. I drink plenty of coffee and my triglycerides are pretty much always <80 mg/dL. This is so interesting, as my cholesterol shot up quite a bit since last year, although everything else is WNL. A few months ago, I started drinking dark coffee from keurig maker (no paper filter). Will abstain a couple of days before my next blood test just to see if it makes a difference. Not very scientific, but still curious. Have you experimented with niacin before a fasted blood test? I was wondering that it might be of use in the protocol. Also I was wondering about flax seed oil – I have read that it it very ketogenic so I wondered if it might also be of use somewhere in the protocol? (5) i’m giving up coffee and retesting. in fact, I just had a test while still on coffee, so I’ll have comparative results. Only question is, my genetics company Vitagene says that the CYP1A2 gene indicates FAST caffeine metabolism, not slow. I find that to be true, I can (and do) drink coffee well into the afternoon with no sleeplessness. I also have low blood pressure and no indications of hypertension. A real Sherlock Holmes mystery perhaps close to a solution … Love this website! Sorry to hear the coffee change didn’t help. Let us know if your most recent change does the fix for you. It’s not totally disappointing. You helped me break a $10 a day addiction. I’m never going back to coffee. Thanks! Thank you for your research!! I am in shock! I have had very high triglycerides for ten years, ever since having my son. My last reading before yesterday was from 2017-11 and was 11.58 mmol/L which I think equals 1025 mg/DL. This was down from my highest reading in 2010 after having my daughter, of 16.79 mmol/L or 1487 mg/DL! (I do not drink alcohol and this was on regular SAD diet. I have always preferred eating carbs over eating protein). For the past 2 wks I cut out all coffee, and I had my blood work done yesterday. I was so excited to see that my triglycerides are down to 4.74 mmol/L or 419 mg/DL! I have not seen them below 789 mg/DL anytime in the past ten years! Also, my ALT and AST numbers are much better. I hate to give up coffee but that difference is remarkable!! Thank you for suggesting that coffee could be an issue. I am going to get serious about doing low carb. I am scared to do high fat with already having what are still high trigs. I was also thinking I should try to do some fasting. Would love any feedback or suggestions you may have. I really want to start feeling better, even if I have to give up my beloved coffee! Hi Cindy! So glad the post could be of help! That is really interesting that coffee had that much of an impact, that is probably the biggest drop I’ve seen. Beyond cutting coffee did you change anything else in that time period? So you may actually see increased improvement after a few months on a low carb high fat diet, as it may reduce inflammation, etc, which can increase triglycerides as well. If you can fast easily (even if only intermittent fasting, or eating in a restricted time window) I don’t see a reason not to, so long as you’re not on medication this could interfere with (although granted I’m not a doctor 🙂 ). Good luck to you and hoping for continued improvement! Thanks so much for this post. I have another intervention I am trying then after I test for that, I will eliminate coffee for 10 days and take another measurement. One suggestion: It would be great if someone who has fixed their Trigs by Coffee elimination could take caffeine pills for 10 days and retest. That would show us whether caffeine alone is responsible for the results. Neither Dave nor I see the effect or we’d be testing it to death! I’m still using the cheapo basic lipid panel. Once I get things optimized better (and am much closer now), I’ll get the NMR instead. Without coffee for 15 days. My trigs dropped from 145 to 79. This is the lowest they have ever been, so I owe you a debt of gratitude! I do plan on maybe experimenting with other caffeine beverages and maybe try instant coffee and see what that does. I don’t miss the coffee very much, but it did give me a slightly sharper mental edge and it is supposed to reduce all cause mortality. Of course, that’s a correlation study across a population. Maybe for those of us where it messes with lipids, it’s increasing mortality risk. HDL is still low at 38. I eat mostly low carb (I eat 3 slices of bread per day) and mostly vegetables, chicken and eggs. Any diet suggestions for this? Hi Mark — If your HDL has been historically low pre-keto, then it may be genetically influenced. If it has just recently dropped to 38 from a much higher number, then I’d be curious about that. Thanks so much for the feedback Siobhan! As for any other changes in that time period, the only thing I can think of is I have been more consistent with my walking and I normally take magnesium. I’m not on any meds. I was on hydrochlorothiazide for elevated bp for awhile but I’m off of it now. I read that it can make your TG even higher and I can’t believe my doc put me on it with already very high TG. What amount of fasting (number of hours) do you think is necessary to bring down TG? Also I was wondering if I should try adding the coffee back in for a week or so and test again to see if it makes a difference? As for the fasting, I’ve heard that they have found great success at IDM with intermittent fasting (eating within a time window and not snacking/eating the rest of the day), so that could be an 8 hour eating window all the way down to a 1 hour window. I’ve also seen this reflected in some studies where they follow people who fast for religious reasons. Some people do longer (say 36 hours a few times a week) depending on what they’re comfortable with. Just make sure to only be 12-14 hours water fasted for any blood test you do, or it could impact the results. I have found intermittent fasting was made largely easier by going low carb, but I’ve heard others say it helped just to stick to whole foods (e.g. no bread, pasta, etc) as it tended to make them hungrier between meals. Plenty of different things to try! One thing you could also do if you wanted to see if low carb helped is to try it out for 4-6 months and then get bloodwork (there is an adaption period hence the longer time period). If it doesn’t, then assuming you were following it strictly, you know to try something else. Experimenting can always be helpful! So i made my job. I had 2-weeks expirement with 6 total measurments of my TG levels durning acute Puer “tea cakes added phase”. I drank my best Puer Cackes both green and black to make sure i have a proper dosage of polyphenol and caffeine in me (and dont forget Puer tea its not just ordinar tea we drink – its very strong and have obvious effect). Result are surprising for me – i have ZERO effect on TG levels – just my regular keto only-water-numbers. I have my labs and everything but i dont think we need another seperate article on this topic and everyting – i bet we have a very few Puer tea lovers in our community. So I started the carnivore deit back in June of 2018, and after a month on the deit I got my blood drawn. I was pretty freaked out cause my numbers seemed way off. Total 271. Ldl 192. HDL. 31. Trig’s. 270. I did comment on another post and u told me to quit coffee for two weeks. Haha well it took me a couple months to finally get that to happen! I just got my blood drawn and got the results back today after a month of carnivore and no coffee and my numbers are total 258. Ldl. 197. HDL. 37. Trig’s 108. I feel like I am pretty happy with the results, any input or if these numbers should be better ? Also just a side note, I had insulin checked too and it was 5.6. I don’t know what ideal would be for that range either. Thanks for any feedback and thanks so much for the suggestions. I feel like u guys are saving lives. It’s generally recommended to get bloodwork 4 months after a significant dietary change (I’ve heard in passing this includes going from keto to carnivore), so perhaps that was all it was. You can always re-introduce coffee later on to verify which it was as long as you avoid the other triglyceride-raising pitfalls. As for insulin, I prefer to see it <10, ideally <5 so you're pretty close to that. The only thing worth noting is the lower HDL - going back through previous results has it always been in the same sort of range? I don’t know how.to change that, I will continue carnivore and hopefully it will continue to improve. Ah okay – I actually experienced the same thing. With SAD my HDL was low to mid 30s, and it has been slowly creeping up over the course of 2 1/2 years (now up to 54 at last test), so perhaps you’ll see the same. As I wasn’t sure, but because it was consistent over previous years with no sudden drops, I just tried to keep an even closer eye on other markers to verify the over all context was something I was comfortable with (in my case low inflammation, low insulin, low trigs, and other lab results coming back normal). I also opted to get a CAC for a baseline so I could check back in 5-8 years to have some longer term information. Perhaps that’s something that would help you as well? I tried that one, they won’t let me do it out of pocket. I would need a doctor’s referral and I don’t have health insurance at the moment. That is on the to do list someday. Thanks for your help ! +1, Same observation, my trigs were stubborn though swinging between 580-120 and in january I had a check that gave trigs of 480. I suspected either this was due to a large fatty meal ~2500 cal the night before the test (~14 hour fasting), or it could be coffee. I let go of coffee for last month and had a check again, I also eat ~1400cal meal night before the check. To my surprise, the trigs went to 55, which I haven’t seen before, the lowest I went was 120. I am slowest coffee metabolizer due to gene CYP1A2 C:C, I guess the coffee was the culprit. Definitely sounds like it was the coffee – the high calories in the day before the test likely did impact the results, but afaik it doesn’t usually increase triglycerides to that level if you were water-fasted 12-14 hours before the blood draw. Glad you were able to figure out what was causing it though! Thanks for this! I’m glad you included decaf coffee in your experiment. Kind of funny but sad but when I asked the doc for the advanced panel tests he was pretty much unaware of them and apparently this was the first time he had ever ordered them (I actually had to get him the test codes from Quest Diagnostics website) and he runs a very busy practice here in the Corona area. Anyways it seems pretty obvious that the coffee and/or caffeine was spiking my trigs big time. Lastly, I just want to say thanks to Siobhan and Dave for taking the time and making the effort to do what you do! I’d really be interested in your thoughts on my numbers. Not much to say. Your last panel is actually pretty close to how mine looks on keto! All your non-lipid numbers look good. And of course, you have given us yet one more data point on coffee. Thanks! I drink at least 30 cups of coffee each day, and I have done so for the past 2 years. My most recent blood test on 19 March 2019 measured my triglycerides at 34 mg/dL and HDL was 84 mg/dL and ApoB was 56 mg/dL. I eat a strict keto diet with carb intake of no more than 20-30g/day. Yeah — once again proving the individuality of it! Dave F, I find your experiments interesting. I see you concentrate the Keto diet just on the lipid profiles without pointing out the effects on other organs and metabolic functions. What about showing glucose, liver enzymes, kidney function, etc. Another concern I have is your fats and carbs are dead foods. What about live sugars like you get from fruits and live oils you get from extra virgin olive oil, avocado oils, coconut oil, etc that are added to the meal rather than heated up. Live sugars and oils are high energy vs the low energy dead stuff your photos present such as grains, processed meats, and fried meat. Thanks for your thoughts, David. I track a very large spectrum of tests with each new experiment. Not just glucose, liver enzymes, kidney — but even hormones, inflammatory markers, etc. Much of the foods I eat are for experiments, but I try to avoid lots of processed oils. Thanks Dave. I try to consume good sugars from fruit, good oils, and proteins from fatty fish. I am not completely keto, but would like to hear more about the other metabolic and hormone changes you are seeing. Such as a particular hormone shifted from X to Y. Dramatic results for me too. LCHF since 12/5/2018, switched from coffee to tea on 4/6/2019, so this represents only six days with no coffee. I have the slow caffeine metabolism genetics. I did drink black coffee on the mornings of my blood tests except for this latest one. That is amazing Don! Not only the trig, but it seems like everything else is better! I’m a coffee guy, and I have blood work coming up in a few weeks! I’m going to stop coffee for at least a week before the test. I don’t have a clue about my coffee-DNA, but I’m not taking any chances! I’m amazed too. Evidently coffee negated the gains I otherwise made via diet. (BTW I was wrong about slow caffeine metabolism. The relevant SNP is rs762551(A;C), normal caffeine metabolism.) What’s intriguing is that coffee never seems to prove to be a big risk factor, so presumably my condition is either a) rare or b) benign. Dave’s experience would seem to disprove a), and yet everything we know says that high triglyceride levels and remnant cholesterol are bad. Very puzzling. There would appear to be an important paper in this area. Good luck on your next lipid panel! It actually worked for me on my last test. I had read about the coffee effect before my last panel and took a break from coffee. On 2/5/2019 and I got the best trig score ever. I would be curious to know what your prior results would have been like if you had been water-only fasted for the 12-14 hours before the blood draw (in other words no coffee). I’ve seen a couple cases of coffee on the morning of the draw impacting the results.